Beet lovers rejoice! This Balsamic Roasted Beets, Quinoa and Kale Salad is so easy and delicious! The beets are sweet like candy, the quinoa and kale make it even heartier and a bit of bacon (totally optional) adds some meaty earthiness. Post may contain affiliate links. If you are looking for a gorgeous fall salad, you have come to the right place! Just look at those beets! They look like candy and they tasted like candy! If you have never roasted beets with balsamic vinegar you are in for a treat (this recipe even ups the candy factor by including brown sugar). 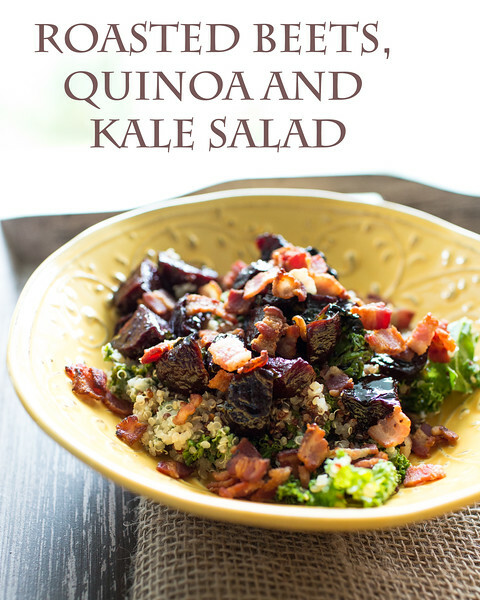 The quinoa and kale are balanced perfectly by the sweet beets. The original recipe called for speck, but I subbed bacon – close enough! If you are not a meat eater, just leave off the bacon, this would still be good! All these bright fall flavors came from Donna Hay Magazine Jun/July 2012. I say it every time I do a Donna Hay recipe, but I can not say enough good things about her donna hay magazine Ipad App. It is beautiful, easy to navigate, has a recipe index complete with thumbnails! I love it! The issue that I found this in, I actually have in print. I used to pay a small fortune to get her magazine delivered to me in the US, but it was so worth it. Now, with her iPad app, I don’t have to! 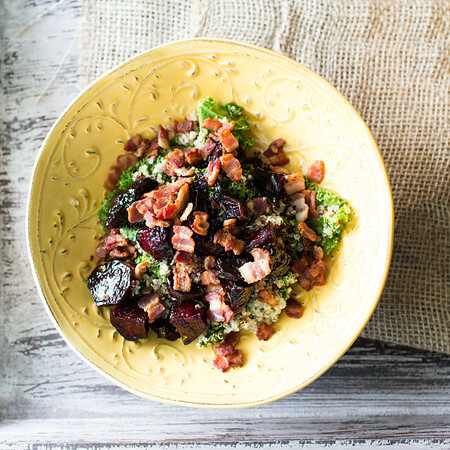 The balsamic roasted beets get as sweet as candy and the quinoa, kale and bacon (optional) turn this into a hearty meal! Preheat the oven to 400. Place the vinegar, sugar, 1 tablespoon oil, salt and pepper, and beets in a small deep-sided baking tray and toss to combine. Cover with foil and roast for 30 minutes. Remove the foil and continue cooking for 30 minutes. Remove from the oven, add the tarragon leaves to the cooking liquid and set aside. While the beets are roasting cook the quinoa in 1 cup of water. Bring to a boil, cover, reduce heat and let cook for 15 minutes. Remove lid and let cook for a few more minutes to let the water reduce. Set aside. Heat the remaining tablespoon of oil in a frying pan. Add the bacon and cook for about 5 minutes are until crispy. Remove with a slotted spoon and let drain on a paper towel. Reduce the heat to medium and add the garlic. Cook for about a minute or until fragrant. Add the kale and cook for 2-3 minutes or until it is just wilted. . Add the kale mixture, salt and pepper to the quinoa and stir to combine. Top with the beets and pecorino and drizzle with the beet/tarragon sauce. We love Roasted Beets and this recipe looks delicious! Thanks so much for sharing this awesome recipe with Full Plate Thursday and hope to see you real soon! Pam that is bowl of awesome goodness, love everything in there, thanks for sharing with Hearth and soul blog hop. pinning. I love this salad! Of course I would have to leave out the bacon ;–( but I would toss in some crumbled goat cheese and be perfectly content! 😉 Thanks for sharing it with Souper Sundays this week. Thanks for sharing with us at Delicious Dish Tuesday! “Balsamic roasted beets…” is enough to make my heart pound faster! Delicious. I am in..I may use spinach instead of kale..cause I bought beets and spinach today..sounds wonderfall! It was. The beets were like candy! Leave out the bacon???? What fun would it be without bacon? Oh, I would never leave out the bacon! It is isn’t it? Thank you! Pam, months ago I became a digital subscriber for the same reason: not only the printed version of the mag was more expensive, it took the mail forever to deliver it here in Brazil. I’m loving the digital mag! That salad looks so good! I love roasted beets, but haven’t done them this way, with sugar. Yum! Lovely and no, the bacon stays! This is a fall salad I definitely want to be eating!! YUM YUM YUM. ALl my favorite things in one place.